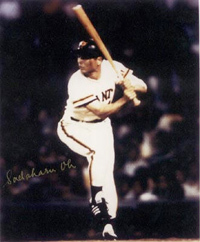 The greatest Japanese baseball player of all-time, Sadaharu Oh compiled a .301 lifetime average while setting records for home runs (868) and RBIs 1,967 and winning two consecutive triple crowns in 1973 and 1974. In 22 seasons, from 1959-80, he was a nine-time Most Valuable Player. Oh also holds the Japanese single-season home run record (55 in 1964). Oh’s Landmark homeruns, including No. 756, which passed Hank Aaron’s all-time record (at the time) and others culminating in his final home run No. 868. 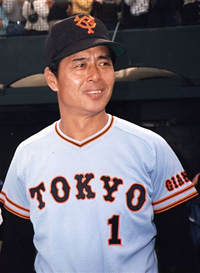 Oh was famous for the unique batting stance, which was designed for him by Tokyo Giants’ hitting coach Hiroshi Arakawa in 1962. The Giants' hitting coach, Arakawa was also a swordsman of some repute. He taught Oh to hit using principles applied by swordsmen. It involved Oh raising his leg toward the plate but required tremendous practice and discipline to perfect. Don’t forget that Japanese pitchers of Oh’s time didn’t throw as hard as U.S. major leaguers. That means Oh was generating more of his own power to propel the balls that far than he would have to against major league pitching. Oh wasn’t blooping fly balls over short fences, either. 191 of Oh’s homers were hit 394 feet or more, which would have put them out over the fence in straightaway right in almost every major league park of Oh’s time, much less down the right field line. Another 286 were hit 361-393 feet, which means many to straightaway right would have gone out, and virtually all down the right field line would have been out of every major league park. And 289 more would have gone out of most major league parks if they had been pulled to the right field corner (361-393 feet). Only 102 were less than 328 feet, and even a few of those would have gone out down the right field line in some major league parks, like old Yankee Stadium. The dispute waged over what kind of success Oh would have had in the United States, but major leaguers who toured Japan for exhibition games in the '60s and '70s felt he would certainly have been a major star in the US, despite pitching that was likely much better here.